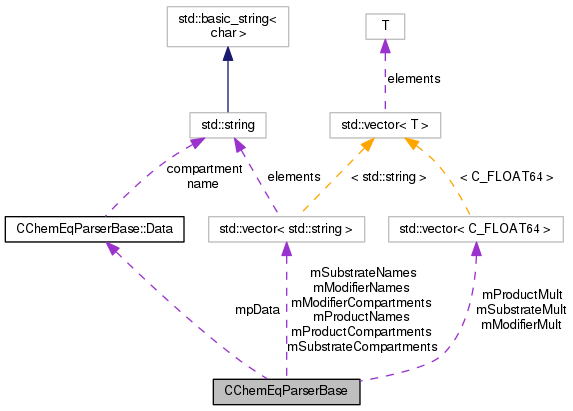 This is a base class for the CChemEqParser adding member attributes to enhance the internal functionality. Definition at line 48 of file CChemEqParser.h. Definition at line 19 of file CChemEqParser.cpp. Definition at line 23 of file CChemEqParser.cpp. Definition at line 56 of file CChemEqParser.cpp. Definition at line 53 of file CChemEqParser.cpp. Definition at line 50 of file CChemEqParser.cpp. Definition at line 47 of file CChemEqParser.cpp. Definition at line 44 of file CChemEqParser.cpp. Definition at line 41 of file CChemEqParser.cpp. Definition at line 38 of file CChemEqParser.cpp. Definition at line 35 of file CChemEqParser.cpp. Referenced by CChemEqInterface::setChemEqString(), CMetabNameInterface::splitDisplayName(), and CMetabNameInterface::unQuote(). Definition at line 32 of file CChemEqParser.cpp. Definition at line 29 of file CChemEqParser.cpp. Definition at line 26 of file CChemEqParser.cpp. Definition at line 1142 of file CChemEqParser_yacc.cpp. References pdelete, strToDouble(), void(), YY_, YY_REDUCE_PRINT, YY_STACK_PRINT, YY_SYMBOL_PRINT, YYABORT, YYACCEPT, yydestruct(), YYDPRINTF, YYEMPTY, YYEOF, yyerror, YYFINAL, YYID, YYINITDEPTH, YYLAST, YYLEX, yylval, YYMAXDEPTH, yynerrs, YYNTOKENS, YYPACT_NINF, YYPOPSTACK, YYSIZE_T, YYSTACK_ALLOC, YYSTACK_ALLOC_MAXIMUM, YYSTACK_BYTES, YYSTACK_FREE, YYSTACK_RELOCATE, YYSTYPE, YYTABLE_NINF, YYTERROR, and YYTRANSLATE. Referenced by CChemEqInterface::isValidEq(), CChemEqInterface::setChemEqString(), CMetabNameInterface::splitDisplayName(), and CMetabNameInterface::unQuote(). 1165 `yyls': related to locations. 1191 /* The number of symbols on the RHS of the reduced rule. 1202 /* Initialize stack pointers. 1204 so that they stay on the same level as the state stack. 1393 Otherwise, the following line sets YYVAL to garbage. Definition at line 107 of file CChemEqParser.h. Definition at line 106 of file CChemEqParser.h. Definition at line 105 of file CChemEqParser.h. Definition at line 92 of file CChemEqParser.h. Definition at line 94 of file CChemEqParser.h. Definition at line 103 of file CChemEqParser.h. Definition at line 102 of file CChemEqParser.h. Definition at line 101 of file CChemEqParser.h. Definition at line 95 of file CChemEqParser.h. Definition at line 99 of file CChemEqParser.h. Definition at line 98 of file CChemEqParser.h. Definition at line 97 of file CChemEqParser.h.